If the thought of dividing perennials, digging up some of your favorite plants and cutting them into smaller pieces, makes you nervous, you’re not alone. After growing for several years, some perennials die back or get old and woody in the middle and have fewer flowers. By dividing, you’re giving the plant a facelift. Often you’ll see a donut, a dead spot in the middle and active growth around the outside, a sign that the plant needs to be divided. Division is also a good way to control the size of perennial clumps that get too big or outgrow their spots. Another reason to divide is to multiply your plants. One perennial clump can be separated into four or five new plants, allowing for bigger groupings and more design punch. If you don’t need them all, you can give divisions away or trade plants with friends and neighbors. Dividing perennials – spring or fall? You can divide perennials in early spring or early fall. The general rule is to divide plants that bloom in mid- to late summer, such as Shasta daisies, in the spring, and early-season bloomers, such as creeping phlox in the fall. Some early-spring bloomers are best divided right after they flower so they’ll reestablish strongly enough to flower again the following spring. These include creeping phlox, Jacob’s ladder, pulmonaria, primrose and rock cress. Many gardeners divide perennials in spring. You gain an entire season of growth and have stronger plants before winter comes. When you have well-rooted plants, there’s less chance of winter frost heave – frost literally pushing newly planted perennials out of the ground. However, some plants survive early fall division better. These include peonies, bleeding hearts, oriental poppies and bearded iris. If you’re dividing plants in the fall, do it early enough to allow for six to eight weeks of root growth before a hard frost. 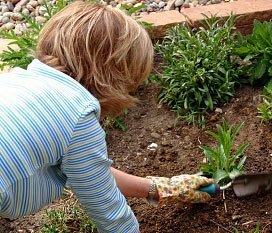 Before digging plants up, cut their foliage back to within two to three inches of the ground. Add a layer of mulch around newly planted divisions just before freeze-up to help keep soil temperatures even and minimize potential frost heave. No matter when you divide perennials, for fastest re-establishment, make big divisions with lots of good roots. If the weather has been very dry, water plants to be divided the day before. Cut into the soil with your spade about six to eight inches from the edge of the plant’s crown, then dig around and under the entire plant before lifting it carefully. Place the plant on the tarp and remove any dead, woody material. Take new divisions from vigorously growing outer sections. Some plants fall apart easily. Shasta daisies, asters, bee balm, or lamb’s ears can be divided into pieces by hand, while others — astilbe, hosta, and Siberian iris — require a sharp knife. Set divisions in a shady spot and protect the roots from drying out with a damp piece of burlap until replanting. It’s best to replant as soon as possible, but if you can’t, pot your divisions up in spare nursery pots and store them in a shady spot, keeping them well watered. To replant, work in soil enrichments like compost or well-rotted manure, rake the bed level, and plant the divisions, leaving enough space for growth (exact spacing depends on the height and spread of the plant at maturity). Water with a dose of water-soluble transplant fertilizer.